Civic engagement and national service are cornerstones of a healthy and thriving country. Connecting the time, talent, and passion of citizens with the needs of a nation can create transformational change both for the individual and the people being served. Over last 20 years 800,000 Americans have had the opportunity to provide intensive community service through AmeriCorps. Together they have tackled poverty in our most vulnerable communities, mobilized millions of volunteers, and provided disaster relief after our most devastating floods, tornados, and hurricanes. AmeriCorps members are catalysts for change - integral tools in our quest for solving complex social problems. The only thing holding AmeriCorps back is scale. Our country is facing enormous challenges but also huge opportunities. What if we connected those out of work young people to national service? 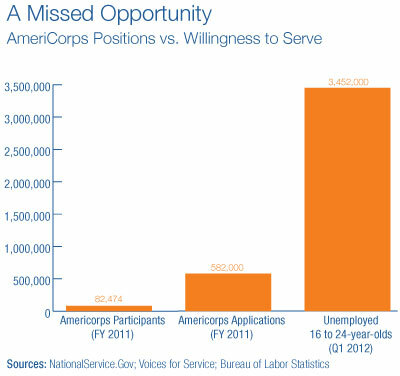 What if we expanded the number of national service slots available each year? What if we could match the talents of 1 million AmeriCorps members with the needs of vulnerable communities across the country? That would be 10 times the number of AmeriCorps members we currently have. 10 times the impact. The Franklin Project, a venture of the Aspen Institute, is developing the case for a large-scale expansion of national service. Their vision is bold and they have assembled a dynamic and influential team to get the job done. 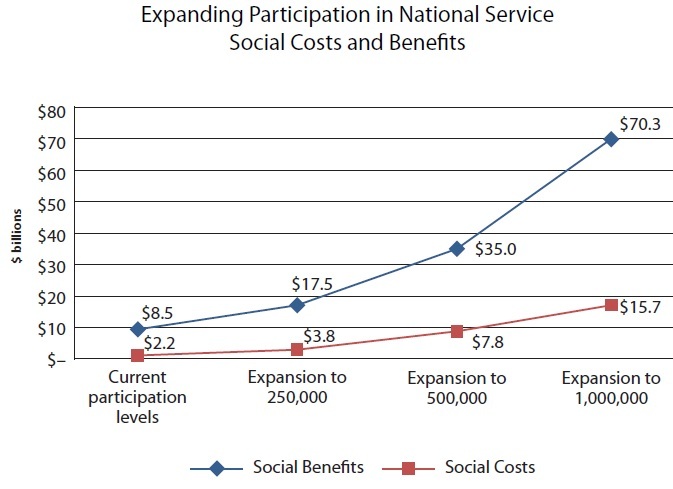 Early research indicates that scaling national service programs would increase cost-effectiveness. The estimated cost would be $20.7 billion but the return would be 92.6 billion. That’s a darn good return on investment. I want to see AmeriCorps scaled to meet the needs of our nation. As the Franklin Project develops the case for expansion, we need to mobilize and activate citizens to support the vision. ServiceNation is doing just that. This national advocacy organization is building a grassroots movement to make a year of national service a way of life. ServiceNation has teamed up with Voices For National Service for the 20/20 Challenge. As an a National Service Alum I support this challenge because I want to celebrate the first 20 years of AmeriCorps and I believe in the vision of taking national service to scale.